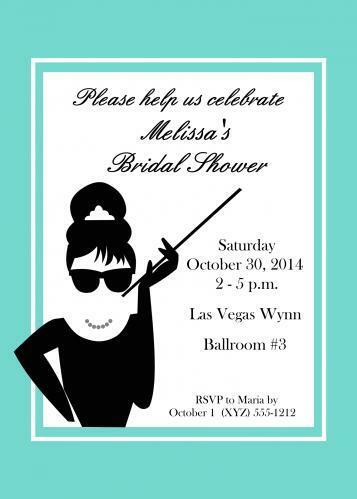 Introducing our luxe line of Breakfast at Tiffany's invitations! We are huge Audrey fans and fell in love with this image! We hope you do too! Send us what you'd like on your Audrey Hepburn inspired invitation and any other instruction you'd like to provide so that we can create for you a one-of-a-kind invite. Of course we'll send you a proof for your approval. Invitations measure 5" x 7". Delivery within 2 1/2 weeks of your approval of your proof. Rush service may be available if needed.